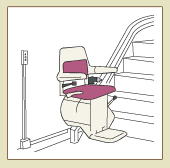 Stairlift Advice : : Do you need a Curved Stairlift? If your staircase has a turn or curve in it, you may need to consider a curved rail stairlift for your needs - it all depends upon the physical layout of your staircase. If you have a sweeping curve, or a spiral or multiple places where the staircase changes direction, you will require a curved rail stairlift. However, if you have a flat landing at the point where the staircase changes direction and that landing is large enough (9 sq ft), it will be possible to install two straight stairlifts, as a more cost effective alternative. This solution assumes that the user will be able to transfer from one stairlift to the other, on the landing. Why Are Curved Rail Stairlifts So Expensive? The main reason is that curved rail stairlifts are mechanically much more complex than straight rail lifts. Bending the rail system so that it follows the contours of the staircase requires expensive and sophisticated machinery and a lot of craftsmanship. A very accurate survey of the staircase is also required and installation is a specialized job for highly trained personnel.